Just one look at this photo and you would have guessed that we were in some wild mood when this picture was clicked. I was travelling from Andhra Pradesh to Tamilnadu in an unit train. We were in an highly animated mood. It was a 4 hour train ride. 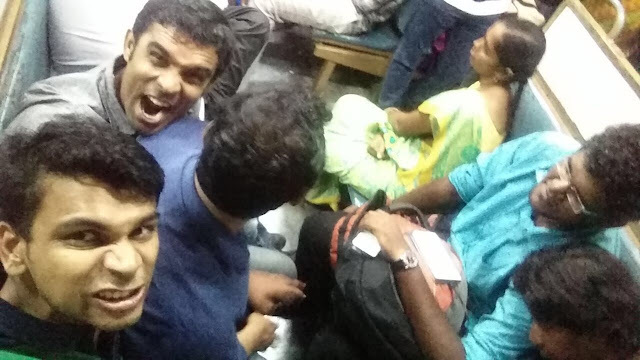 2) I was responsible for the lady in yellow saree to sit in the corner seat in that same pose all along the journey. She must have thought that I was mentally unstable. 3) I bit the shoulder of the man ( in dark blue shirt) sitting next to me while he was sleeping. He mistook the guy to his right ( the guy who clicked this selfie) as the one who bit him. 4) When some one in the compartment farted silently, I found the culprit using the inky pinky ponky technology. The victim eventually got off the train in the next station. But the fart smell continued to emanate from the compartment. May be a different person; but it was not me. 5) Everyone in the compartment displaying signs of dozing off were kept awake with my barking sounds. This was one of the reasons why the lady in yellow saree assumed that I was mentally unstable. She was also the only witness of the biting incident. I left so many memories for so many people to ponder, yonder and think about restarting their lives again. Some are scarred for life and some are confused for life. But as they say, life just goes on. So these are the 5 small stories that are associated with this picture. Till I come back again with yet another story around another picture, live peacefully.